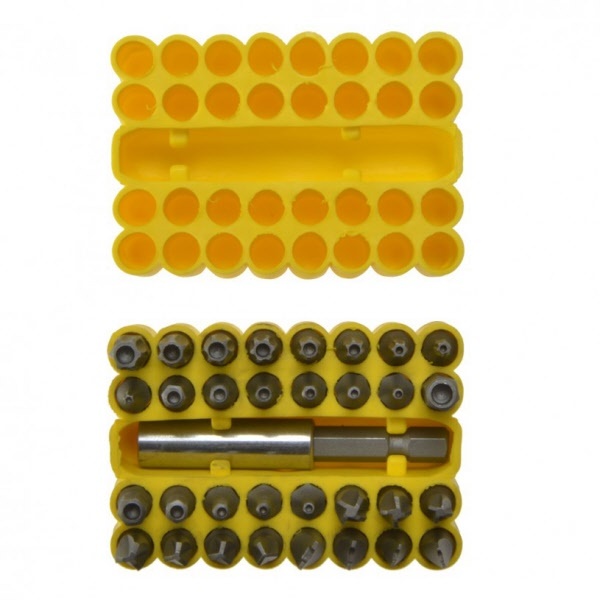 33 Piece Security Bit set, Torq, Torx, Bi & Tri wing, Hex in rubber holder. << Back 33 Piece Security Bit set, Torq, Torx, Bi & Tri wing, Hex in rubber holder. 33 P:iece Security bit set and holder comprises of a selection of 25mm long ¼" insert security bits generally available on the market. The Torx* bits have holes in the end to accommodate the pin in the security fixing. Supplied in a handy plastic storage box.